Internships are one way students gain practical experience before entering the workforce. For agricultural education students, experience is traditionally gained through student teaching. Some students decide to pursue industry experience through internships. Crystal Dau collects soil samples as a part of her internship for Monsanto. “I have a passion for promoting agriculture and educating all age groups,” says Shelby Bargmann, a senior in agricultural education. 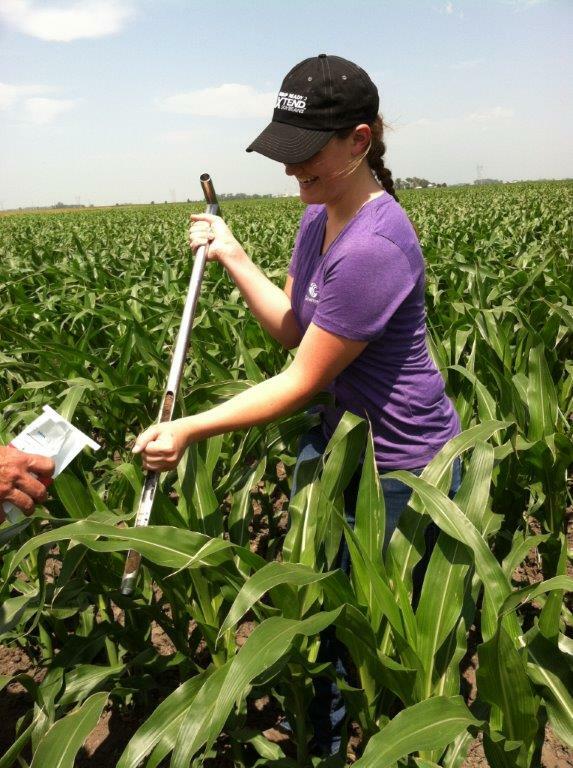 Bargmann interned with the K-State Research and Extension district office in Salina, as the Central Kansas District intern. “Agricultural education gives me an opportunity to work with all age groups and promote and advocate the importance of agriculture,” says Bargmann. Working as a research and extension intern gave Bargmann an opportunity to make contacts and connections that will be beneficial when she graduates, along with many experiences and memories she will have forever. Bargmann advises all agricultural education students to pursue internship opportunities in their areas of interest. Having an internship allowed her to compare teaching in a classroom versus extension work and helped her see all the different opportunities there are for agricultural education majors outside of a classroom. Internships also have potential to change the course of a student’s life as Crystal Dau discovered. Her internship at Monsanto in Kearney, Nebraska, as the US Row Crop Sales Intern led Dau to discover her passion for crow crops. She is well rounded in the industry but did not discover her passion for crops until coming to Kansas State and her internship with Monsanto. “I learned to create relationships with people and how to have and sustain meaningful conversations with them,” says Dau. Event planning, time management skills and flexibility in scheduling are other valuable lessons Dau gained from her internship. “Getting hands on-experience in the field will allow students to learn firsthand about crops,” says Dau. “It is really neat to see what the industry is looking for in an agricultural education program,” says Dau. She also was able to network, and her internship with Monsanto could lead to a future job with the company..
After completing her internship with Monsanto, Dau chose to change her major from agricultural education to agronomy. Internships allow students to discover where their passions lie and to make industry connections. Agricultural education students extend their knowledge and opportunities by participating in internships and have bright futures ahead of them.